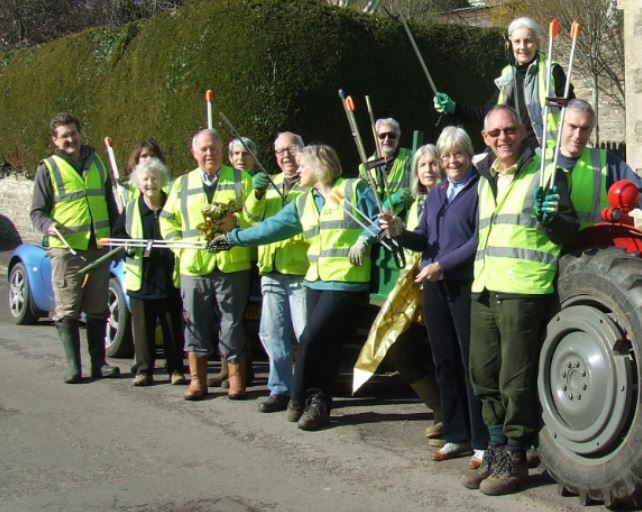 Once again this year we will be giving our village the annual spring clean. Anyone wishing to join in would be more than welcome – we will be meeting outside the village hall at 10am on Sunday 19th February. Depending on the number of volunteers, it usually takes us around two hours to cover all the lanes in and out of the village. Please wear suitable clothing and protective gloves, children will be most welcome but will need to be supervised. I will organise hi-vis vests, bags and litter pickers and will post the health & safety information on the village noticeboards so you can read at your leisure. If anyone with 4 x 4 or tractor/trailers who could help drop off people and pick up bags along the way that would be most welcome – please just let me know if you can help – sarahwilson@comptongardenflowers.co.uk mobile: 07836 201611. Our collection of litter will be gathered in the pound and Bath & North East Somerset council will pick-up wc 20th Feb.
On a previous occasion, when the weather was kind!